Two years ago, my marriage was a complete mess. My husband was constantly working late, and some days we hardly had time for meaningful conversation. As a work-from-home mom, I felt tired and alone, with no one to share my ideas and dreams with. I was on anti-depression medication, and we went to several counselors to get our marriage work. And then, there was the guilt! I accepted Jesus as my Savior during my post graduation, but due to parental pressure I chose to marry a man who did not accept God as I did. When my marriage was on the rocks, I felt guilty for making the wrong choice of husband. I should have waited for God’s choice for me. And that led me to feel that this man was not the one God created for me! I had picked the wrong person!!! And yes, through all this I was praying and reading the Bible! What a hypocrite I was?! And then one day, God intervened. He took away a big contract that was a major source of my income. I was totally devastated, because that was my security in the midst of my chaos – the idol I was holding onto. God used that time to bring me closer to Him. God led my online searches to the right Christian blogs and articles. He used songs to speak to me; He wooed me back to Himself. It was the return of a prodigal daughter back to her Father. As I started studying the Word diligently, He revealed the idols that had taken His place in my life. It wasn’t easy to remove them and place God in His rightful place. The major turning point in my marriage happened when I read a similar 31 Days to Love series at Time Warp Wife. And that’s how I came to know Jolene – it was her “Who is on the throne of your marriage?” article that totally changed the course of my marriage. Fast forward two years and our marriage seems like a fairytale. My husband still hasn’t come to know the Lord personally (but I am sure he will!). It wasn’t my husband who changed… It was me!!! There were many things God had to chip away (and it’s still in progress) but here are 7 tips that saved my marriage. I made the mistake of depending on my husband for emotional security. I looked to him for filling my need to be loved and cherished. But the Word of God taught me that only He is my anchor and Savior. I just need Him TO BE COMPLETE! This was a major stumbling block, as being a believer for the last 13 years made me feel superior to my husband. God showed me Psalm 36:2 which says, “For in his own eyes he flatters himself too much to detect or hate his sin.” My spirituality made me blind to my own faults. I am as much a sinner as my husband is. How could I forget that?! 3. Respect Him and… SHOW it! As a a former teacher, I have a tendency to correct and instruct. God taught me to listen more and speak less. When you feel like correcting or instructing your husband, REMAIN SILENT and ask God to cover him. 5. Thank Your Husband Often! This is the easiest way to make him cherish you. Thank him for every single thing he does – from opening a door for you to giving you a good time in bed. I text and email him thank you notes, conveying how blessed I am to have him. I’m a very headstrong person, with strong opinions on everything. Submitting completely to my husband was totally out of my comfort zone. I cannot in complete honesty say I’ve mastered being submissive, but I am trying. Praying for your husband is the ultimate love language. Stormie Omartian got it right! Prayer changed our marriage and gave it a new depth. I did a 31-day prayer challenge (again!) which covered all vital aspects of being a husband. I now ask him everyday how I can pray for him. He in a way feels secure that I have him covered with God. 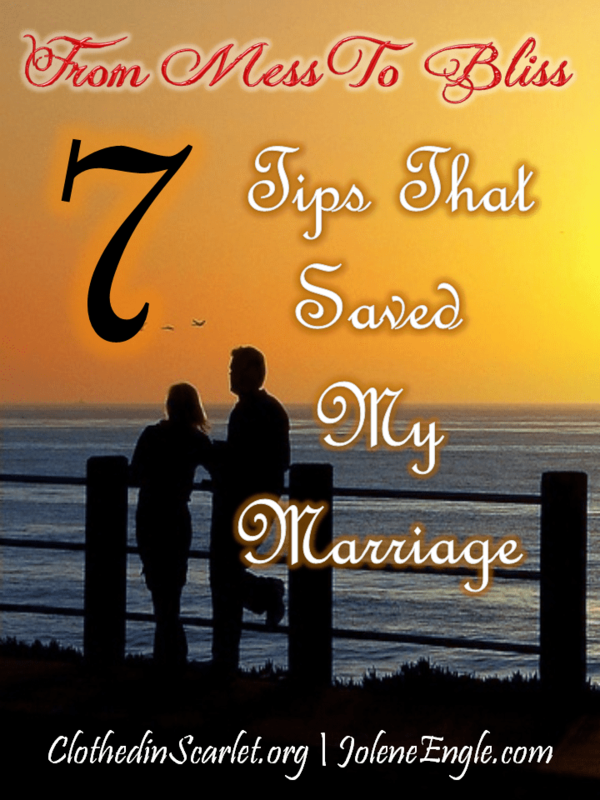 These 7 tips helped my marriage a lot, but it was truly God who was the restorer. He is in the business of creating love stories that last. He worked in me and made me realize that my husband was indeed the perfect companion for me – my better half. If you are going through a tough time in your marriage, seek God first and the rest will fall into place. All this is to say, I appreciate this post and will start with praying for God to work on my heart. It certainly can’t hurt. oh Janet, praying will never be a waste. It bear fruits and I am sure, God’s name will be glorified through that. Trust in Him and He will restore your marriage. Yes, definitely, He will be first working in us and through that He will change our husbands too! Sometimes it can feel like you look all around you and you can feel like God just isn’t answering your prayer or you feel like you can’t see Him at work anywhere around you. While it can be frustrating to feel like you are the only one putting forth an effort and while it may SEEM that way, you don’t know what work God is doing in your man’s heart. Your sweet responses, loving words and supportive actions can soften your husband’s heart and stir in him a conviction and desire to respond in kind and love you as he should. He might just be taking a bit longer to respond than you’d like. Sometimes our own selfishness can get a hold on us and keep us from loving our spouse as we should and we’ve got to let God break through that wall. I had a wall of selfishness that I put up and wrapped around my own heart that, like mud on a window, blinded me to my own husband’s hurt until God broke through that wall and shined His light on my dark, ugly places. And it hurt! And it hurt to humble myself before my husband. But it was also freeing and put our marriage back on the right path. And claim the promise of Job 23: 10. Gold has to go through the refiner’s fire in order to have all the impurities burned out. God is our Refiner, and He does love you and does care about what you’re going through. He is using your husband to refine you and make you more like him. Sometimes God uses people in our lives, sometimes pain or illness, sometimes other difficulties to refine us and grow and transform us into a beautiful vessel for His use. As tears fell from my eyes, I feel some comfort in your words. Thank you for encouraging me. I just know that our marriage is not what God intended it to be and I long for it to be there. More and more I am seeing that it has to start with me regardless of how I am feeling towards or about my husband. Again, thank you! Thank you so much for sharing your wisdom…Nan. It’s so encouraging! I Peter 3:1 is something which I hold onto and has helped me tremendously! THANK YOU for writing this!! I felt every. single. thing. you wrote was coming straight from my mind/off my lips. I, too, am a teacher, opinionated, and (honestly) superior-acting woman. Even though my husband is a believer (thank you JESUS!) he is a newer Christian than me. My husband is also very passive. My sinful nature is to dominate him and to control. I needed to hear these tips and I will do everything to apply them, truly! Thank you again and God bless you! Vanessa, I am so happy that this article spoke to you. And it was exactly like this for me. God used to lead me to the right articles and resources that I really needed at that point… (and He still does that!!). Listen to His little whispers and walk with Him! Joan, thank you! God is a miracle worker! And thank you for visiting my website. It is wonderful knowing you are not the only person out there going through the exact same thing and that there are steps to making your marriage better! Thank you! Thank you. Tina, you are not in this alone. God is with you every step of the way! I am blessed to have married a husband who is a believer, but can I add that these are also tips that will KEEP a marriage on the right track! I definitely struggle with these things– making it clear how much I respect my husband, not feeling spiritually superior, keeping my mouth shut, etc. But when I do these things well, I can see how much it helps our marriage. It’s such a relief to know we’re not alone. Not only are there other women who are going through the same things we are, but God is 100% with us in this! Like you said, “God is in the business of making love stories that last!” YES! Thank you Jaimie. So glad you liked the tips. Yes, we are not alone and I sincerely hope our journeys will encourage many! Thank you for sharing . I also feel as if I could have written the story. I am not quite where you are , but I am trying day by day. Its so nice to hear from other women that live in faith by themselves. Thank you Rosann. The feeling of spiritual superiority was one of my major stumbling points. I am really glad Holy spirit used my article to speak to you. He really knows what and when we need something!! Sunu…wow…this was so raw and real. I have to say I once struggled with #2 and saw it tearing down my husband and my marriage. Oh, but the King of kings is faithful and gives much grace. He opened my eyes through His Word and I saw what I was doing. And #4 is huge in a marriage. We don’t always have to speak our mind and if we desire to speak it, we need to first go the Lord in prayer and seek His guidance. He may just tell us be quiet and, if not, He will give us the right words with the right heart. Thank you for sharing and I’m blessed to be doing this series alongside you. Blessings. Naomi, That is a great point. What you said is so true… He does often give me the right words with the right heart to speak to my husband later! The thing is to take it to the Lord and follow His voice..!!! Thank you for sharing that..
LOVE this Sunu! Great tips!! Thank you so much for this article. I am going to take these tips to heart and am working on praying more instead of correcting my husband! 🙂 Thanks again for sharing! Oh…Beth I am so glad you are taking these tips to heart. Its God working here my girl! He is the one who made me write this and He is the one who led you here. Follow Him and you will not regret the journey! Thank you for this blog post. I felt as though I was finally reading the words that have been swirling around in my own mind for the last couple years. “You picked the wrong guy!! This isn’t the one God created for you! I should have waited! !” That is what I feel like screaming on almost a daily basis. My husband claims to be a Christian, but has never been the spiritual leader of our household. He comes from a family who does not know Jesus and has horrible habits that he was surrounded with growing up (yelling, never apologizing, etc.) His actions and angry words speak louder than his values. I pray every day for his heart to soften and for God to make him into the man that I need. But while reading your post I realized what I need to do – that despite how I can’t stand his attitude sometimes, I need to learn how to respect and love him. Treat him as my husband and while doing that God will also work on my hardened heart. THANK YOU for being so honest and open. Thank you Rose..for your kind words. I am happy that you gleaned something here. Yes, having personal relationship with God is the most important thing in being a Christian!